Pine grosbeaks are unusual winter visitors to Westborough. This pine grosbeak has flecks of fruit on its beak from plunging it into crabapples to eat the seeds inside. A small flock of female and juvenile pine grosbeaks, all colored like this bird, has been feasting in ornamental crabapple trees in Westborough. Traditionally called the Hunger Moon or the Wolf Moon, January’s full moon was shining brightly around the time of our recent cold snap, so it was in keeping with the season to see hungry birds wolfing down dried fruit. Robins descended on sumacs, eating up their small hard berries, and pine grosbeaks visiting from the north feasted on ornamental crabapples in local parking lots. Even in winter, robins are a common sight in Westborough, but pine grosbeaks (Pinicola enucleator) are pretty unusual. 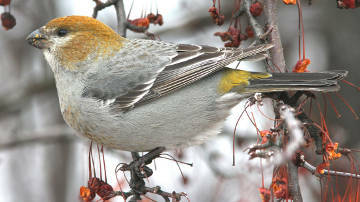 Pine grosbeaks do well in the cold and typically live year-round in the northern forests of Canada and northern Maine. They’re about the same size as robins. What are pine grosbeaks doing here? They’ve come to eat. Like certain other northern birds, they occasionally move south in large numbers. They do so in years when their usual winter foods are scarce. Different northern birds eat different things, so they all don’t necessarily show up here in the same year. But this winter, several kinds of northern birds have appeared in our area. The reason may be last year’s widespread drought in Canada, which led to scanty seed crops in different kinds of trees and shrubs. Even so, pine grosbeaks are infrequent visitors. The last time many of them came to the Worcester area was five years ago, during the winter of 2007-2008. Another way to look at it is that they’re here courtesy of human commercial development. Without the ornamental crabapple trees lining our parking lots, we might not see pine grosbeaks in Westborough. They’d still come south in a year like this one, but they’d probably go somewhere else. Pine grosbeaks are named for their big beaks and the pine, spruce, and fir forests where they live up north. They use their heavy, cone-shaped beaks to crush seeds and clip buds off branches. Why are these seed-eaters going after fruit? They seem to be gobbling down crabapples, but a closer look will show you that they’re eating the seeds inside, not the flesh of the fruit. They plunge their beaks into the crabapples hanging on trees and take only the seeds. You can often see a tell-tale mess of fruit on their beaks and faces. These birds also leave bits of uneaten fruit hanging from stems on the trees. Pine grosbeaks eat in the same manner when they devour one of their favorite wild foods, the red fruits of mountain-ash trees. A few of these trees grow in our area, usually planted as ornamentals. So keep your eye out for pine grosbeaks in local crabapple trees. These birds like each other’s company, so they tend to stick together in small flocks. They often hang around a good fruit tree until its bounty is gone. The pine grosbeaks visiting our area so far this year are mostly females and juveniles (which look very much like adult females). They’re gray with two white wing bars and golden-yellow or slightly rust-colored heads and rumps. Males are scarce in our area this year. They’re not hard to spot if they’re around, as they were back in 2008. They’re more colorful than females and juveniles. Males are red and gray instead of yellow and gray. If you spot a tree full of pine grosbeaks, you might find that the birds seem relatively tame. They’re not easily disturbed. Sometimes you can almost walk right up to them. These visitors from the north are finches. Like the goldfinches we commonly see, they have a bouncy or bounding flight. How long will they stay? They’ll probably only be in Westborough as long as the crabapples last, but they might remain in the area through March. They’ll eventually return to the north, where they nest in pine forests. During the breeding season, both males and females develop pouches in the floor of their mouth for carrying food to their young. If you were to travel to parts of northern Europe, such as Sweden, Norway, Finland, or to Siberia, you might see pine grosbeaks there, too, where the forests are similar to those in Canada. As you watch for pine grosbeaks, you may notice other birds eating dried fruit. Robins and cedar waxwings often clean up the last of the fall fruits as winter wears on. Happily for us, spring is almost right around the corner. Groundhog Day, on February 2, marked the half-way point between the beginning of winter and the beginning of spring, but in many ways, spring begins in February as the natural world begins to stir. Watch for the signs – great horned owls nesting, red-tailed hawks pairing up, squirrels chasing one another, skunks leaving their burrows to search for mates around Valentine’s Day – and listen for a little bit of birdsong. Enjoy!